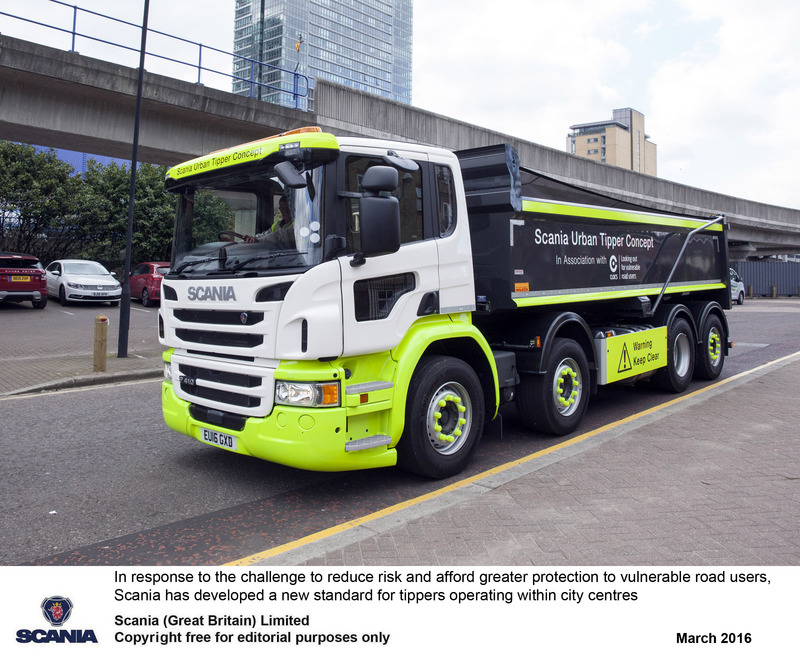 In response to the challenge to reduce risk and afford greater protection to vulnerable road users, Scania – the UK’s market-leading eight-wheel tipper supplier – has worked with its industry-partners and academic research bodies to develop a new standard for tippers operating within our city centres. Equipped with a lightweight Wilcox body, the vehicle has been specified for applications where it is anticipated that 90-95 percent of the vehicle’s driving-time will be on the public highway. 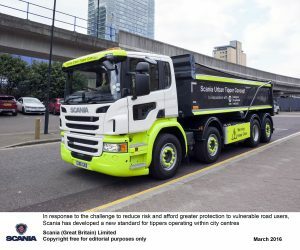 The first public showing of the truck was at the Construction Logistics, Cycle Safety and work related road risk (CLOCS) exhibition staged at ExCel London on 23 March 2016. Breaking away from the 8×4 norm, the 8×2*6 configuration provides a highly manoeuvrable chassis with three steering axles. Requiring only Selective Catalytic Reduction (SCR) to meet the Euro 6 exhaust emissions standard, Scania’s 410 horsepower unit has broken fuel-efficiency records in independent trials conducted throughout Europe. Two-pedal Scania Opticruise transmission enhances safety in operation by reducing stress and fatigue on the driver. Enables the chassis height to be lowered when driving in urban areas, thereby also lowering the driver’s eyeline for better direct vision. Suspension can be raised to increase ground clearance when working on more demanding terrain. 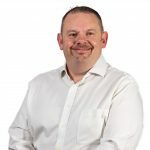 Developed specifically for the UK market, the large glass panel provides the driver with a direct line-of-sight to the front nearside of the vehicle. 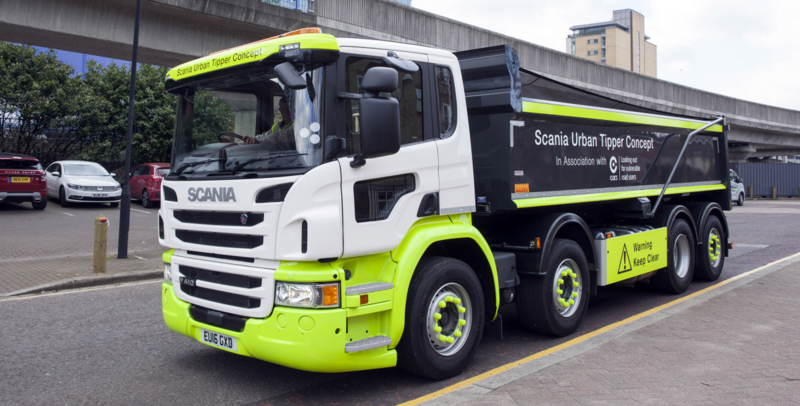 The Scania Urban Tipper features a range of proven safety features including Advanced Emergency Braking (AEB), Lane Departure Warning (LDW), Electronic Stability Program (ESP) and a Camera Monitor System by leading safety solutions provider, Brigade Electronics plc.